Here is a thread for clan business, such as picking a clan name, deciding on your scale color, and building your dungeon (I hope to have some basic rules for constructing an underground lair pounded out by tonight). So here is something to think about. Do we focus on killing or capturing invaders. Capturing, sleep darts, net traps, pit traps and nonlethal combat. Pros and cons of both. Killing. Pro: easier to defend dungeon. Con:less valuable to some people and monsters. Capturing. Pros: slaves, can be sold or traded to monsters or slavers for service or profit (fiends for their souls, monsters for their live dinners, some undead for their souls, slavers for their service.) Can be used to breed more kobolds. (possibly) Cons: harder to defend dungeon. I personally lean on the side of focusing our efforts on capture because the rewards could be pretty great. Also I like the idea of having different monsters serving as traps and minions and this is the easiest way for that to happen. What do y'all think we should focus on? Well, I think it's very Koboldy to try to do a little of both. Captives are always useful, and we can always execute them anyway if we decide we have too many, they prove untrustworthy, or we can't find a better use for them. Killing is just very efficient, though. I think it's wise to put the capture-style traps around the perimeter of the den. Nets, pitfalls, snares, and any of the whacky stuff that our trapsmiths might want to test out for science. But closer to our actual living space and last defenses we should be utterly cutthroat. Falling rocks, giant scythe blades, falling rocks with alchemist's fire, hails of poison arrows, pit traps with falling rocks, pit traps with falling rocks with alchemist's fire, etc. My character, Krinn, personally prefers whatever is most efficient in defending the homestead; however, he'll lean towards methods that might leave, say, a wizard's spellbook unharmed. If we're all partial to a specific colour/pattern of course we could just choose that. I'm not at all picky, though, so interested to hear what you guys think. Red is just one of my favorite colors overall but I'm fine with rolling if anyone is adverse to the color red. 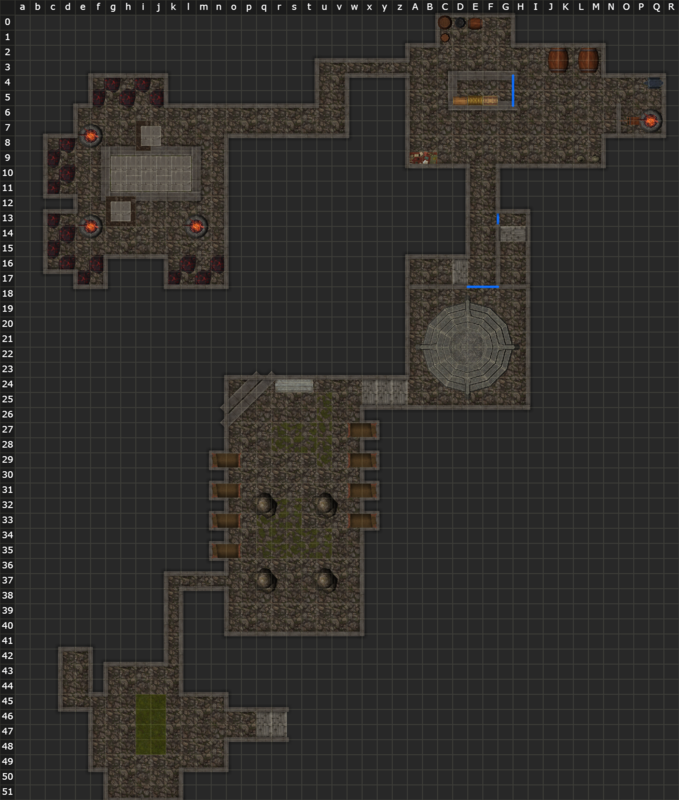 Does this map look good for a starting Kobold Hall? Thanks. I *should* be able to add rooms as the clan expands. I am kind of deciding how much time it will take to dig a room, or set a trap, and I think that's the last custom rule I need before we can start. I think my plan is to keep a tally of living kobold, and have them generate "building points" that can be used to make rooms. Simple Traps will probably be a survival check, along with materials and tools. I seem to remember the old Dungeoneer's Survival Guide from like the AD&D era had a chapter about mining rates and stuff like that. AFAIK they haven't released anything quite like it since, but it might give you some inspiration. For scale colour(s), what about striped green and tan (or red). Sorta like the gremlins from the Gremlins movies? As we will placing traps for the nasty adventurers to stumble into, and I would seriously laugh, if the game turns out like even half of the original Gremlins movie. Grease down a ramp, while we go through a secret passage, anyone? Best I can do is Gremlins 2: The New Batch. Apparently, Gremlins 3 has had it's script written, and is closer in tone to the original. I hope it's out in the next couple of years, as that would be killer. I'm actually a fan of how crazy G2 is. It's like they gave the director comple control and he vowed to make sure the studio regretted it. Which should be a genre of film. im still partial to the color red 1. because its the color i see most commonly used for kobolds and 2. red is simply my favorite color.